TCU Volleyball failed to earn the comeback victory Wednesday night, falling to Baylor 3-2. Photo by Cristian ArguetaSoto. TCU fought through deficits again Wednesday to force a fifth set against Baylor; however, unlike last week’s 3-2 win over West Virginia, the Frogs could not complete the comeback. TCU lost the match 3-2 (17-25, 25-14, 15-25, 26-24, 8-15) to drop their conference record to 4-5. 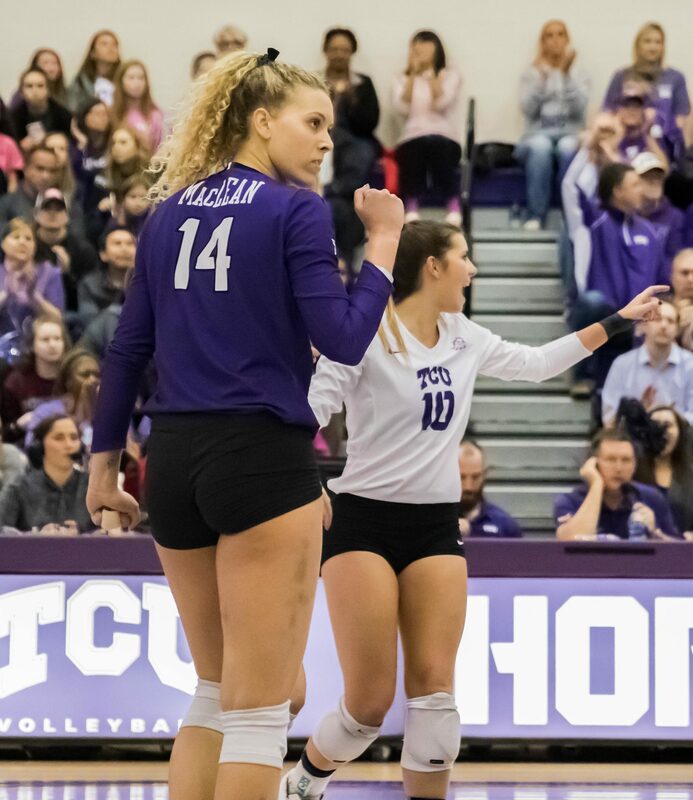 In their matchup with the Bears earlier this season, TCU Volleyball was not able to handle the offensive firepower of Baylor and lost the match 3-1. After the first set of tonight’s match, it looked like this contest might end the same way. Bears outside hitter Yossiana Pressley recorded 7 kills while hitting .333 to lead Baylor to an easy 25-17 win. Pressley would finish the match with 30 kills and 11 digs. TCU had hit just .095 in the opening set, recording only 11 total kills. The story was much different in the second set, though. The Horned Frogs recorded a team hitting percentage of .423 while holding the Bears to just .069. A service ace by setter Tori Dilfer put the Frogs up 18-10 late in the set, and TCU had no problems from there, dominating the set 25-14. Setter Tori Dilfer (4) leads the Big 12 in service aces and assists. Photo by Cristian ArguetaSoto. Dilfer, the Big 12’s leader in both service aces and assists, finished with two aces and 43 assists on the match. After cruising in the second set, the Horned Frogs returned to their first set woes. Unable to contain Pressley and Baylor’s outside hitter Aniah Philo, TCU trailed 12-4 early in the set. Philo had four kills in the set as part of 11 kills in the match. The Frogs looked lost offensively in the set, hitting .190 with only 8 total kills. They struggled to compete with the Bears and lost the set 25-15. Riding an electric crowd in the Rickel, the Frogs looked alive to start the fourth set. They scored first and continued to lead for most of the set. The Frogs had finally found a source of offense in outside hitter Lexi MacLean and middle blocker Katie Clark. Both players recorded 4 kills in the fourth set alone, giving TCU enough to squeak out a 26-24 victory and force a fifth set. Senior outside hitter Lexi MacLean (14) gave the Frogs the life they needed to force a fifth set. Photo by Cristian ArguetaSoto. MacLean finished the match with 9 kills and 12 digs, while Clark recorded 14 kills of her own. Following the same pattern they had all match, the Frogs had no answer for the Bears in the fifth set. Baylor started the set on a 3-0 run and never looked back. TCU was unable to penetrate the Bears defense, hitting a shockingly low -.095 and only recording 3 kills. The Frogs lost the final set 15-8 to drop the match 3-2. The defeat lowers their overall record to 12-8. Next up, TCU heads to Lubbock to face Texas Tech. TCU defeated Texas Tech at home earlier this season, 3-1. “[We need to be] figuring out what we need to sharpen up a little bit these next two days before we play Tech because they’re a great team and a great team at home,” outside hitter Anna Walsh said. First serve against the Red Raiders is set for 1 p.m. Saturday Oct. 27.